Click the tab Picture on the left panel of the main interface. Click the button Add themes Online under the pictures. Choose a theme in the Theme Online dialog box that pops out and then click the Add button in the popup. The downloaded theme will be installed automatically. Each theme includes a background picture and a set of lovely buttons. After you add a theme online, the background picture and the set of buttons will be added to the Picture and Button tab control panels respectively. You can use the pictures in the built-in themes. Or you can download themes online, see 3.1.1. Anyway, you do as follows: Click on the background picture displayed on the Picture tab control. And then click the Apply button at the top of the main interface. You can freely use your local pictures as the flipbook background. Just do as follows: Click the Add Local Picture button under the display panel. 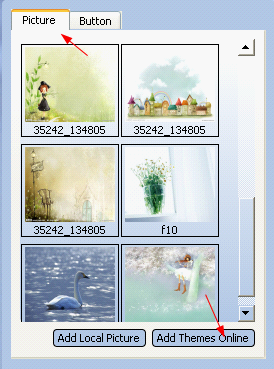 In the Add Scene dialog box, choose the picture you like and then click Open. If you want to delete some picture displayed on the panel, you can right click on the picture, and then click Delete on the menu that appears. After downloading a theme (see 3.1.1), the buttons will be displayed on the Button tab control. You can click on the Button tab to view the icons of different sets of buttons. Then, click on one icon. Click on the Apply button at the top of the main interface. To use a set of local buttons, please click the Button tab, Click the Add Local Buttons Button. Choose the folder including the buttons designed by you. Click OK. Then the icon of this set will be displayed on the panel. What does a set of buttons include? A set of buttons must include 20 buttons. The icon size is 32x32 (pixels). The following is the list for of them. If you design icons by yourself, just make sure that name the icons according to the third column as below. Go back to 3. How to Design Flipbooks. 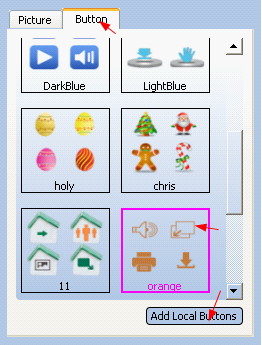 Go to see other steps in How to use Flipbook Maker.